Oil industry workers encounter many serious risks in the oil fields. Despite the fact that oil and gas companies are required by federal and Texas state laws to provide safe workplaces and implement robust safety programs to prevent oilfield injuries, accidents in the industry occur at alarming rates. In a single year, the Houston Chronicle found that 79 workers lost limbs, 82 were crushed, 92 suffered burns, and 675 broke bones in oil industry work accidents that were reported to insurance carriers. That same year, more than 65 people died at oil and gas industry worksites, which represented a 60 percent increase in on-the-job fatalities from the previous year. Head and brain injuries: concussions, traumatic brain injuries, skull and facial fractures, and facial lacerations. Neck and back injuries: spinal cord injuries, severed spinal cords, pinched nerves, herniated or ruptured discs, broken vertebrae, whiplash, and paralysis. Bone injuries: Broken bones, shattered bones, hairline fractures, compound fractures, and dislocated bones or joints. Limb and extremity injuries: partial amputation; total amputation; crushed limbs; and temporary or permanent damage to the functionality of arms, legs, feet, hands, fingers, or toes. Soft tissue injuries: tearing of muscles, tendons, and ligaments; sprains; and strains. Burns: first-degree burns, second-degree burns (partial-thickness burns), third-degree burns (full-thickness burns), blistering, and scarring. Skin injuries: lacerations, chemical burns, frostbite, cuts, punctures, and bruises. Workers who suffer any of these injuries may be entitled to compensation by their employer or other responsible parties. An oil field accident lawyer can help determine who is responsible for your injuries and how much compensation you deserve. On any drilling site, workers are required to operate dangerous heavy equipment whether they are drilling, pulling pipe, mixing mud or performing one of the many other jobs required of them. Sometimes this equipment fails causing significant injuries. These failures happen for a number of reasons, including improperly trained or inexperienced hands, mechanical failures caused by overstress, inadequate maintenance, or careless safety inspections. Sometimes, failures result from a design or manufacturing defect. The law requires that heavy machinery on job sites be safe for workers to use and that such equipment be properly maintained to prevent accidents. Also, workers who are required to operate heavy machinery should receive adequate operational training and safety training so as not to put others at risk. If you were injured by a heavy equipment failure, you might be entitled to financial compensation for your injuries in addition to any worker’s compensation benefits you receive through the insurance claim process. Depending on the nature and cause of your accident, you might be able to recover money from a third party, such as the company that designed and manufactured the heavy equipment. Oil and gas industry workers must deal with the risk of fire or explosion at work sites. Wells, trucks, tanks, and other heavy production equipment can release flammable gases and vapors that can be ignited by open flames, static electricity, friction, or other heat or electrical sources. Pressure buildup is also a significant area of concern for anyone working in and around a well site location. A fire or explosion at an oil field can cause serious injuries to workers and may even be fatal. If you were injured as a result of a fire or explosion, you may have a claim for damages against the person or company responsible. A well blowout is the uncontrolled release of crude oil or natural gas during the drilling process. These blowouts are typically the result of failures in pressure control systems in wells. Even though modern oil wells contain blowout preventers that are designed to reduce the risk of a blowout, these types of accidents still occur. An accidental spark or contact with an ignition source during a blowout can lead to a catastrophic oil or gas fire. If you were injured at an oil or gas extraction site as a result of a well blowout, you may be entitled to compensation for your injuries and other losses. Investigations into these complex accidents can take several years, and workers who have been injured in a well blowout often face long delays in being issued compensation. A lawyer can help you identify who is responsible for a well blowout, and can help you obtain money damages for your injuries and other losses associated with your accident. Hydraulic fracturing (or “fracking” as it is commonly known) has reinvigorated the US oil and gas industry and has produced billions of dollars in revenue for Texas oil companies. But fracking, which involves the high-pressure injection of water or a fluid mixture into a borehole to create cracks in deep-rock formations through which gas or petroleum can flow, is inherently dangerous. Serious accidents and chemical spills at fracking sites are becoming more commonplace, and workers often suffer devastating injuries as a result of these accidents. Oil and gas workers are often injured as a result of truck and vehicle accidents at or near work sites. Single-car overturns, collisions with other work site vehicles, and collisions with stationary objects, like heavy equipment, are common causes of injuries to oil and gas workers. A number of factors may contribute to vehicle accidents at a drilling site, including poor driving conditions, driver fatigue, drug and alcohol use, and improperly maintained vehicles. Accidents involving cars, trucks, or other vehicles at an oil or gas extraction site present a number of challenging legal questions. It can be difficult to determine who is responsible for the accident and whose insurance company should be responsible for paying for any injuries as a result of the accident. There are additional questions about the role of worker’s compensation insurance and whether negligence or recklessness played a part in the accident. An oil field accident lawyer can help you address these questions after a truck or vehicle accident at a job site, and can help you determine what your legal options are. Injuries caused by slips, trips, and falls are common in the oil fields and at other oil and gas extraction sites. Oil field workers are often forced to work long hours in challenging outdoor environments, which increases the chances of a slip or a trip. Moreover, many petroleum and gas extraction workers are required to access platforms and equipment that are located high above the ground. Although employers are required under Occupational Safety and Health Administration (“OSHA”) regulations to ensure that walking surfaces are safe and to prevent falls from elevated equipment, slips, trips, and falls are among the most common causes of serious and fatal workplace injuries and deaths. If you have suffered a slip, trip, or fall at an oil or gas extraction site, an experienced workplace accident lawyer can help determine whether your employer may have failed to take adequate precautions to prevent your injuries. Workers are often required to enter confined spaces, such as storage containers and storage tanks. There are a number of workplace safety hazards associated with confined areas, such as asphyxiation, crushing accidents, exposure to dangerous levels of hazardous chemicals, and ignition of flammable vapors or gases. Without proper training, equipment, and procedures in place, oil field workers can get seriously injured in confined spaces at job sites. In some cases, your employer may be required to obtain a written permit to require work in a confined space and comply with guidelines established by OSHA, the federal agency responsible for ensuring safe workplaces for Americans. If you were injured at an oil or gas industry job site, you may be entitled to compensation for your injuries and other losses. 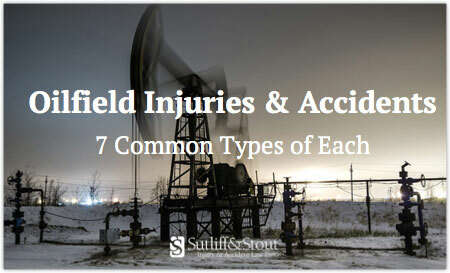 An oil field accident lawyer can help you understand your rights and identify which parties, if any, must compensate you as a result of your accident. Contact the team at Sutliff & Stout today for a free case review from a qualified injury attorney.